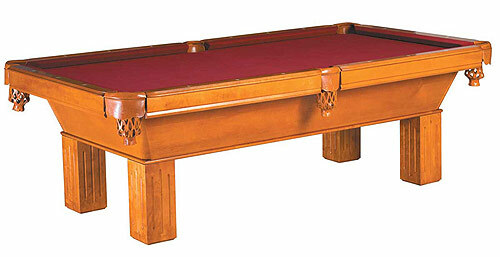 This simple yet classy Pool Table features rails made of solid maple wood (oak on Windsor medium oak) with double mother of pearl diamond sites and K-66 profile natural gum rubber cushions. It has a straight frame MDF cabinet with veneer covering. The legs are square style made of solid wood. As expected of any quality Pool Table, the Windsor features a 3 piece 1 inch thick diamond honed slate with a solid core liner.